Dr. Lincoln J. Ragsdale, Sr. was a leading activist in the battle for civil rights in Arizona. 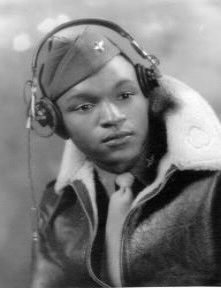 After graduating from Tuskegee flying school in Alabama in 1945, he relocated to Luke Air Field in Litchfield Park, Arizona, becoming one of the first black pilots to serve at that installation. Ragsdale believed that it was his “Tuskegee experience” that emboldened him and gave him direction. “It gave me a whole new self-image,” he maintained. He “remembered when we [Tuskegee Airmen] used to walk through black neighborhoods right after the war, and little kids would run up to us and touch our uniforms. ‘Mister, can you really fly an airplane’ they’d ask. The Tuskegee airmen gave blacks a reason to be proud.” Their service also gave the 2.5 million black veterans of World War II incentive to believe that they could achieve much more in their communities and the nation. Since Ragsdale was commissioned after World War II, he did not fly a military combat mission. However, during his stay at Luke Air Field, he fought a different kind of war. The eleven Tuskegee officers stationed at Luke Air Field were housed with white, southern roommates. “Phoenix was unquestionably the Mississippi of the West,” Ragsdale argued, and the racial views of their roommates affirmed this belief. Ragsdale recalled that his roommate “didn’t come to the room until late that first night.” When he arrived, he was incredulous. As soon at Ragsdale’s roommate saw him, he asked Ragsdale where he was staying and made it clear that he did not want to live with a black man. “I said I was staying with him,” Ragsdale recalled, “and he stormed out of the room.” These interactions taught Ragsdale a great deal about racism in the military and in Arizona. After settling in Phoenix, Ragsdale became one of the leaders of the local NAACP, Phoenix Urban League, and Greater Phoenix Council for Civic Unity (GPCCU), to fight racism in Phoenix. In 1953, Ragsdale helped desegregate the Encanto District, Phoenix’s most affluent and segregated neighborhood. Also in 1953, he helped desegregate Phoenix high schools one year before Brown v. Board of Education. Ragsdale also helped desegregate Phoenix’s most influential corporations as early as 1962 including Motorola, General Electric and Sperry Rand. In 1963, he positioned himself as a cornerstone of a political campaign that wrested Phoenix city government away from an elite group of white civic leaders. Between 1963 and 1992, he fought for diversity in Phoenix’s public and private sectors, and for entrepreneurial opportunities for people of color in Arizona. Ragsdale also played a major role in the Martin Luther King Holiday movement in Arizona, an effort that ended after twenty years of struggle when Arizona became the first state to create a Martin Luther King holiday by popular vote in November of 1992. Lincoln J. Ragsdale Sr. died in Paradise Valley, Arizona on June 9, 1995 at the age of 68. Matthew C. Whitaker, Race Work: The Rise of Civil Rights in the Urban West (Lincoln: University of Nebraska Press, 2005); Lincoln Ragsdale, Sr., interview by Mary Melcher, April 8, 1990, Phoenix. Tape recording. Arizona Historical Foundation, Hayden Library, Arizona State University, Tempe; Lincoln Ragsdale, Sr. and Eleanor Ragsdale. Interview by Dean E. Smith, April 4 and November 3, 1990, Phoenix. Transcript. Arizona Collection, Hayden Library, Arizona State University, Tempe. Sr., interview by Mary Melcher, April 8, 1990, Phoenix. Tape recording. by Dean E. Smith, April 4 and November 3, 1990, Phoenix. Transcript. Arizona Collection, Hayden Library, Arizona State University, Tempe.